Gisa Nico started Butterfly Garden Preschool in 2004 after teaching special education for the Santa Monica-Malibu School District. She has her Master's degree in special education and a teaching credential in California. With over 22 years of experience in the field of education, she has not only served as a public school elementary teacher, but also as an educational therapist in a private clinic for students in middle and high school. Gisa received over 70 hours of specialized reading instruction to serve the diverse needs of students the clinic. She enjoys volunteering as a special education consultant for agencies that need teacher training on special needs or help modifying curriculum for students who are differently abled. Her educational interests include: art education, the Montessori method, Cognitively Guided Instruction in math, and curriculum development. Gisa is thrilled to serve the families and children at Butterfly Garden Preschool!!!! Marisol Hurtado-Rivera is starting her 10th year at Butterfly Garden. 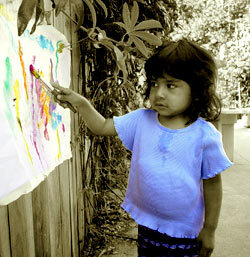 When Marisol was younger she attended a Montessori school from kindergarten all the way through middle school. Marisol loved the way the Montessori method gave her the opportunity to grow and this sparked an interest to become a Montessori teacher herself. Marisol studied the Montessori method (in Spanish) while living in Mexico. She started working with kids in the elementary grades in Guadalajara in 1999. Then, she moved to the United States and started working at a Montessori preschool. She decided to get her certificate in the Montessori method (in English this time). She has also worked as a Spanish teacher in Austin, TX as well as offering spanish classes after school at Butterfly Garden. Marisol is excited for the oportunity to continue her career as the Montessori teacher at Butterfly Garden Preschool. Yolanda Crooms was born and raised in Los Angeles and is a true California native. She has been teaching for over 20 years and has enjoyed every bit of it. Yolanda has her bachelor's degree in education with an emphasis in early childhood education. Yolanda's favorite subjects are science and reading. She enjoys getting her hands dirty with science. Her hobbies include traveling, dancing, reading, quad riding, and singing. She loves animals and protecting the environment and is passionate about recycling.